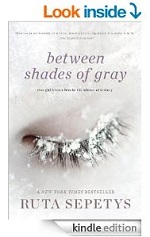 Before I proceed with this review, I need to clarify: this isn’t one of those Shades of Grey books. We keep things clean here at the Nauvoo Times. Ruta Sepetys’ Between Shades of Gray tells the story of a Lithuanian teenager’s exile in Siberia during Stalin’s reign, much to the chagrin of several people that came to Sepetys’ book signings thinking she wrote the other Shades of Grey books. Between Shades of Gray opens with Soviet officers arriving at fifteen-year-old Lina’s house at night to arrest the family. The novel documents her multi-year and 6500-mile journey through multiple prison camps, and her own internal journey to find hope and strength in the face of brutality and despair. Lina learns to recognize and emulate the different kinds of strength she encounters in her family and fellow prisoners, and how to use her art to find healing. She learns that love and hope are not only possible in horrible circumstance, but essential. I’m most impressed with Sepetys’ ability to strike the right balance with the atrocities she documents. The Soviets killed millions during Stalin’s reign, and the lives of those deported were horror-filled. Sepetys doesn’t shrink away from the ugliness and pain — the topics she faces include starvation, forced sexual servitude, and senseless killing. Sepetys faces these topics honestly, but also keeps the level of detail appropriate for a young adult audience. Her focus remains on celebrating resilience instead of despairing about cruelty. I also have a soft spot for authors that utilize their family history in their fiction. Between Shades of Gray is especially interesting to me in this regard because she tells the story of those her family left behind. Lina’s family was deported for their role in assisting family out of the country; Sepetys’ father escaped, but her relatives that stayed in Lithuania were sent to Soviet prison camps. The novel is a beautiful tribute to those that paid a huge price for the freedom her family enjoys. Between Shades of Gray gave me a deeper understanding of a part of history that I’d possessed a limited knowledge about. Sepetys’ writing was powerful and beautiful, haunting and hopeful. It is an important story to tell, and I’m glad Sepetys used her considerable gifts to tell it. You understand the importance of telling the stories of those in history that have suffered, especially the less familiar stories. You love celebrations of the power of art to bring hope — Lina finds great strength through the work of Edvard Munch and in creating her own art. You like highly accurate and highly readable historical fiction.